Our premium quality banner material, perfect for long-lasting displays. Supplied with hems and eyelets, ready to hang. 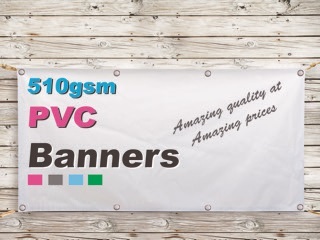 Don’t compromise on quality with our great value 510gsm Premium PVC banners. Printed in full colour with high resolution print, these banners stand out for the right reasons. With tough, tear-resistant PVC, they last – even outdoors. 510gsm Premium PVC banners have multitude of uses at a variety of events such as advertising banners, street campaign/event banners, corporate event banners, sporting event banners, birthday or party banners and much more. With hems and eyelets for ease of hanging. Please save as a CMYK pdf at 150dpi at a scale of 1:1 with 3mm bleed, with no crop marks.